Sweden’s Johan Kristoffersson has won the 2017 FIA World Rallycross Championship presented by Monster Energy with two rounds still remaining. PSRX Volkswagen Sweden [Kristoffersson and team-mate Petter Solberg] has also won the teams’ championship after a dominant season with its pair of Volkswagen Polo GTi Supercars. Kristoffersson took his fifth event win – and ninth podium – in a row at the Neste World RX of Latvia in Riga this weekend extending his commanding lead at the top of the driver standings to 62 points [60 points remain over the final two events of the season]. PSRX Volkswagen Sweden also leave Latvia with a 112-point advantage in the teams’ championship – a big enough gap over Team Peugeot-Hansen to guarantee VW the team trophy. Meanwhile, Kristoffersson’s team-mate Petter Solberg was involved in a collision on turn one of today’s second semi-final which saw the race red-flagged. The Norwegian was taken to hospital for precautionary checks where x-rays later revealed that Solberg had broken his collarbone. EKS driver Mattias Ekstrom finished runner-up at today’s race in Latvia, while Team Peugeot-Hansen’s Sebastien Loeb rounded out the podium. In the final round of the FIA European Rallycross Championship for Supercars, it was Anton Marklund in his Volkswagen Polo who was crowned the 2017 Euro RX Champion after finishing the five-round season 28 points ahead of runner-up Thomas Bryntesson in his Ford Fiesta. Tamas Pal Kiss [Peugeot 208] ends the year in third place. Robin Larsson finished second in Euro RX today at the wheel of his Audi A1 and is fourth in the end-of-year standings. Runner-up Ekstrom was first to congratulate the new World RX Champion. “I always think the best man deserves to win and Johan has proved that he is the best driver on the track this year,” admitted the 2016 World RX Champion and two-time DTM Champion. Hoonigan Racing Division’s Andreas Bakkerud finished fourth this weekend – the Norwegian making a slow start off the line on today’s final but setting fast lap times to make his way up to fourth. Home favourite Janis Baumanis delighted the home crowds, the Latvian STARD driver fought closely with Bakkerud and DTM star Nico Mueller throughout the final. Baumanis eventually finished fifth. In only his second World RX appearance, EKS driver Muller ended the event sixth overall. Latvian World RX star Reinis Nitiss [EKS] made the semi-finals in front of his passionate home fans but failed to make it through to the final race after losing time behind Timmy Hansen who was slowed due to a rear-left puncture. Overnight leader Topi Heikkinen suffered a broken driveshaft in the semi-finals, dashing the Finn’s hopes of a spot in the final. 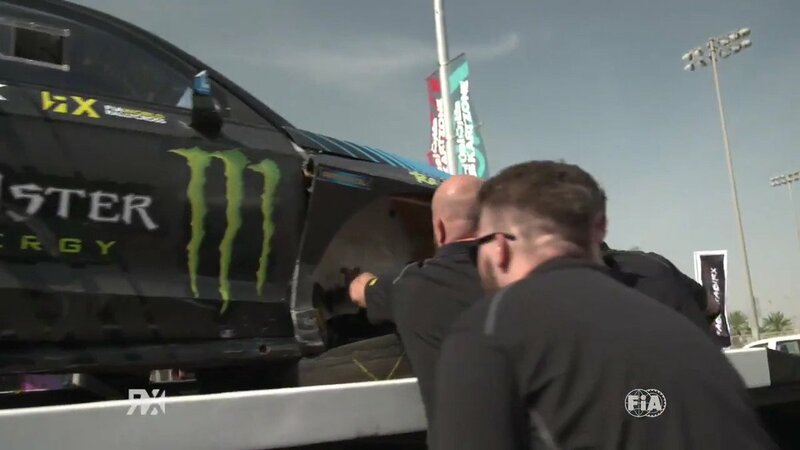 Elsewhere, the Austrian MJP Racing squad did a heroic job of repairing Timo Scheider’s car overnight after the Ford Fiesta caught fire during Saturday’s Q1. The penultimate round of the FIA European Rallycross Championship for Super1600 saw Hungary’s Krisztian Szabo take the win in his Skoda Fabia. Rokas Baciuska and Jussi-Petteri Leppihalme finished second and third respectively. Home hero Artis Baumanis finished second in semi-final one but a throttle problem with his Skoda Fabia meant he was unable to start the final. Szabo now leads Baumanis in the S1600 standings by 12 points. The penultimate round of the 2017 World RX Championship will move to Germany in two weeks’ time as the FIA-sanctioned series prepares for more rallycross action at the Estering. Germany RX will also mark the final round of the S1600 Championship. Nico Muller #51, received a reprimand in the final for pushing car #9. Joni-Pekka Rajala #60, disqualified from Q2 for use of the launch control button for 1.5-seconds (driver aids). Francois Duval #67, disqualified from Q2 for use of the launch control button for 2.5-seconds (driver aids). Nicolas Gronholm #68, deduction of ten championship points for use of a new turbo seal after initial scrutineering. Mart Tikerbar #23, fined €250 for failure to attend the Drivers’ Briefing. Peter Hedstrom #8, fined €250 for being late to administrative checking. Alexander Hvaal #53, fined €250 for being late to administrative checking. Peter Hedstrom #8, received a warning for failing to order fuel in advance of the event. Alexander Hvaal #53, received a warning for failing to order fuel in advance of the event. Joachim Hvaal #63, received a warning for failing to order fuel in advance of the event. Thomas Bryntesson #90, reclassified sixth in the Final for pushing. Jere Kalliokoski #14, disqualified from Q2 for use of tyres that did not comply with the regulations. Alexander Hvaal #53, disqualified from Q1 for use of tyres that had not been registered. Martin Kaczmarski #69, disqualified from Q2 for use of tyres that did not comply with the regulations. Ollie O’Donovan #2, received a five-second time penalty in Q3 for an incident with car #24. Andrea Dubourg #22, disqualified from Q4 for being underweight. Tamas Karai #102, received a reprimand in semi-final two for an incident with car #74. Ulrik Linnemann #2, received a warning for failing to order fuel in advance of the event. Edijs Oss #49, received a reprimand in Q2 for an incident with car #46. Lars Christian Rosland #80, received a reprimand in Q3 for an incident with car #14. Marcel Suchy #30, received a five-second time penalty in Q4 for an incident with car #29. Arvo Kask #29, received a reprimand in Q4 for an incident with car #30.